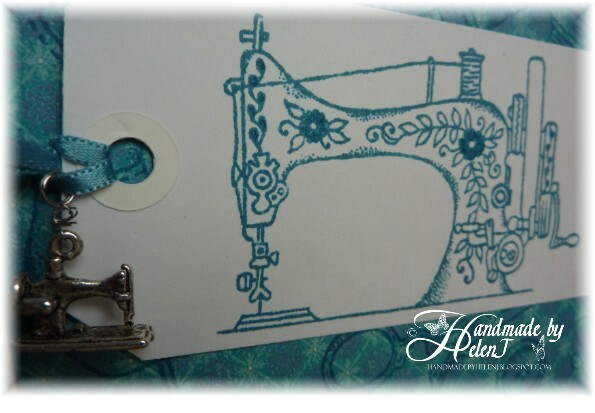 My sister is an accomplished seamstress so when I saw a range of sewing-themed stamps by Sue Dix for Personal Impressions I just couldn't resist them. The sets are called "Lace and Thread", "Vintage Sewing" and "Love is the Thread" and this card is a mix of stamps from all 3. And no, I hadn't been drinking when I took the photo above! 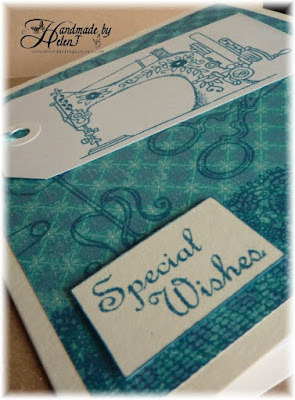 As teal is her favourite colour I used Memento Teal Zeal ink to randomly stamp some of the images onto a K & Company backing paper. The main image was stamped onto an Inkylicious tag with some of the details of the sewing machine coloured in using a Cut 'n' Dry nib & more of the Memento. 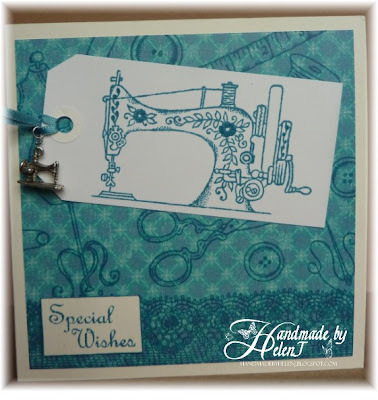 The charm is by Crafty Bits, and the ribbon was coloured with Promarker Duck Egg.